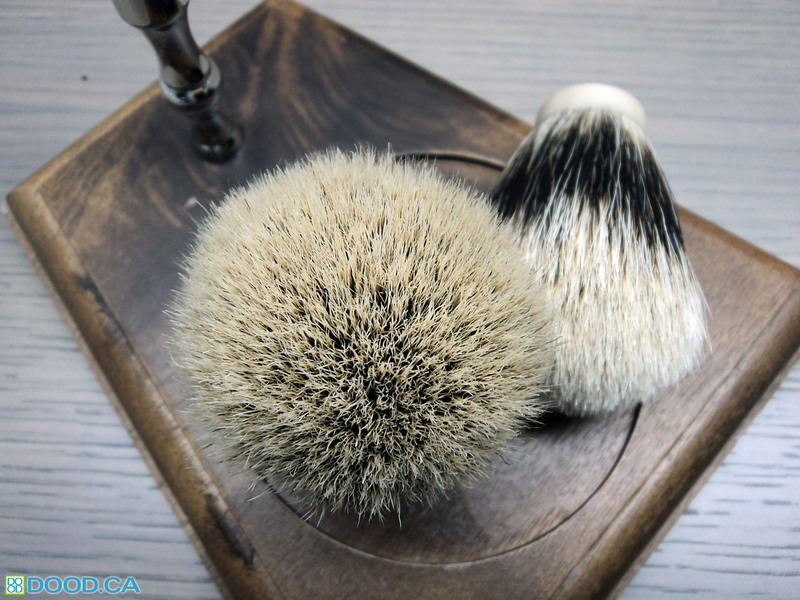 After experiencing both the Ace Shaving Best Badger and the Extra density Silvertip knots, I thought it was time that I also tried out their two-band offering, the Ace Shaving Finest. The largest size they offer is the 24mm, which is sort of the perfect mid-sized brush for many. Its not too big, but not too small. I personally really enjoy all sizes of knots for all occasions, though I would have to say 26mm knots tend to have the right amount of luxuriousness for me. The knot is a medium-ish sort of density, with perhaps a touch less density than the TGN Finest knots. 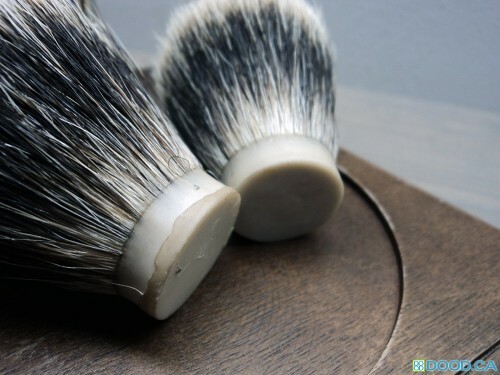 The appearance is similar as well, but with the Ace Shaving having slightly less dark banding. The bands are sort of a medium-dark brown as opposed to the very dark brown of the TGN knots. Tips are a creamy off-white, and are all naturally terminating – a nice looking and feeling knot. The plug is a solid off-white color, as are all of Ace Shaving’s knot bases. This is different than what TGN used to use, but looks similar to some of the newer knots they are stocking. There is a close-up of the plug, which on one of them has a hairline crack. It doesn’t appear to be splitting, it just looks like it might be. Knot is still solid. The knot bases measures 23.5mm, but there is quite a bit of flare out after the plug, due to the “glue bump” and probably would need another 2mm at the hole to mount this knot properly. I have not mounted one yet, but plan to soon. Here’s a shot to give you an idea of the density. I have plugged it into a handle to try a test lather and it works quite well. Its a pretty soft knot with less backbone than the TGN Finests, but I believe they don’t feel as soft but are less scrubby. Neither has much scritch. So far, this knot does not exhibit the gel-like tips that have made the TGN Finest such a popular knot. Overall a superb knot, worthy of a good handle and worthy of your best shaving cream. The knot is priced nicely, slightly below TGN’s prices but offers a comparable but slightly different experience. Once I’ve mounted this knot I will go into a more in-depth review of the performance based on the way I mounted it. 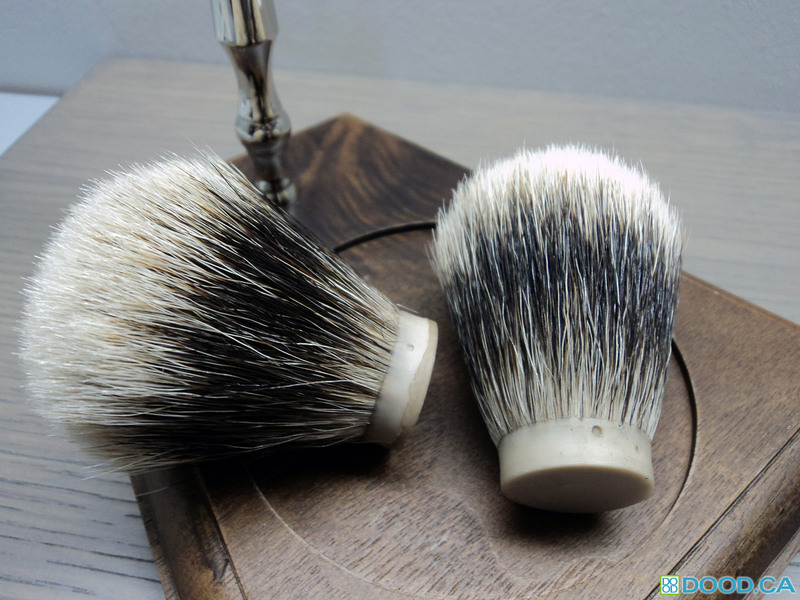 This entry was posted on Monday, August 26th, 2013 at 5:34 pm	and is filed under Shaving Brush Knots. You can follow any responses to this entry through the RSS 2.0 feed. You can leave a response, or trackback from your own site.